The graveyard at the Haunted Mansion has always been filled with the tombstones of those who met with, shall we say, unfortunate ends. Coincidentally, or rather deliberately, the names are nods to the men and women who put a piece of themselves into the attraction. With the revamping and expansion of the cemetery in 2011, many other noteworthy names were given proper burials as it were. They were not the last additions, however, as towards the end of the year a small device was affixed to crypt of Prudence Pock. 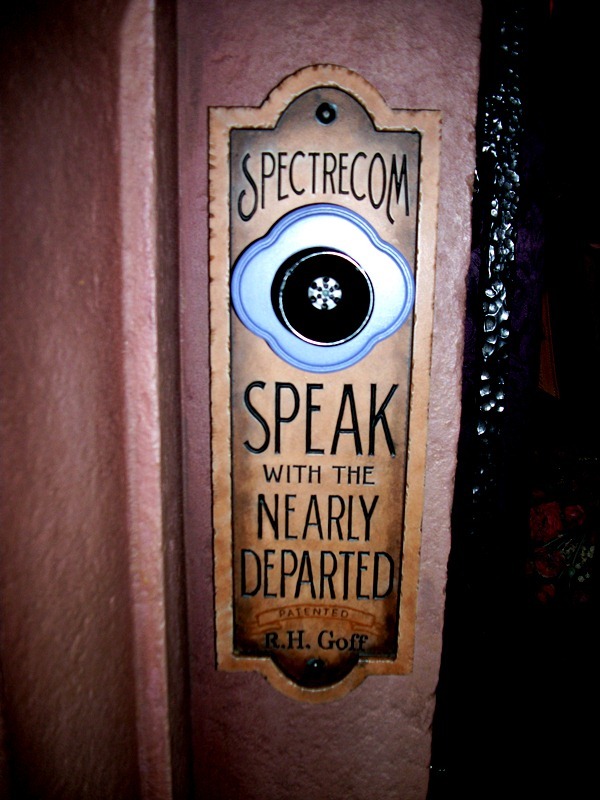 According to the fine print at the bottom of the Spectrecom, the device has been patented by R. H. Goff. Known best as Harper Goff, this renowned Imagineer was actually born Ralph Harper Goff, the crafter of 20,000 Leagues Under the Sea’s Nautilus for the 1954 film. What is his contribution to the Haunted Mansion, you might ask? Oh, just a little bit of concept work. Also in the 1950s, Goff was asked to help create a haunted house attraction for Disneyland. Original designs included a church with a graveyard running up a hill to a dusty, old mansion that would be situated off of Main Street, and had a more Midwestern feel to it than the sleepy mansion style of the south. Perhaps one day, in a park somewhere in the world, we’ll finally get to venture just off of Main Street, through a lonely cemetery, and up to a mansion for a ghastly encounter. Until then, we’ll have to remember Goff’s Haunted Mansion contribution through stories and pictures, and from speaking with the nearly departed with the Spectrecom.